The key to living on a budget successfully is having a good range of store cupboard basics. Building them up from scratch can be costly if you buy them all at once but you can spread the cost by buying one item each time you shop. 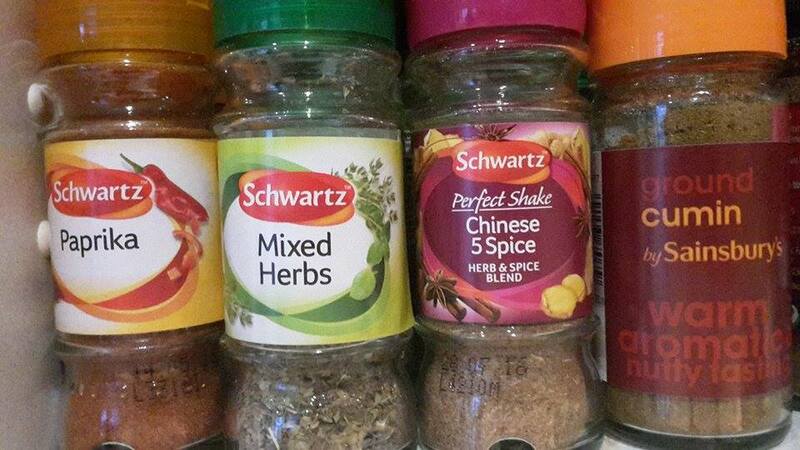 Mixed herbs (Italian inspired meals, pasta etc), Cumin (curry, falafels), Mild Curry Powder (have a guess… but also, bread and a few other bits and bobs!) Paprika (dusting on hummus, potato wedges), Chinese five spice (stir fry, marinades), Mixed spice (lovely for puddings, cakes) and Rosemary and Thyme (usually for seasoning various chicken/turkey dishes). I always have some plain flour in my cupboard; we are homemade pizza fiends and it is a regular dish in our household. Plain flour is also the base ingredient for making roux for sauces, bread etc and is a handy staple. We also always have self-raising flour as the kids love baking cakes and I always forget to buy baking powder (and then when I do it usually sits back in the back of the cupboard until it’s out of date!) I also have ’00’ flour… I could pretend that I am a master of Italian foods but I have only made my own pasta once, it was just about edible but I need to keep trying; it mostly stays there as it makes me feel more professional! Ha! My store cupboard basic tins are chopped tomatoes, chickpeas, tinned peaches, mushy peas, curry sauce, and soup. Where possible I like to make my own curries and soups but I always have a tin/jar of curry sauce on hand and a few tins of soup for when we are pushed for time. Chopped tomatoes are the key to so many dishes… pasta sauce, pizza sauce, curries and one of my favourite dishes uses three of my store cupboard tins (chickpeas, peaches, chopped tomatoes). I always ensure I have those three staples in, as then I know I always have a back-up dish on hand. (I alter the recipe slightly to use mild curry powder instead of fresh chillies as they irritate my stomach, it makes the dish cheaper too.) This is Jack Monroe’s Peach and Chickpea curry…it is absolutely delicious and you would never know that it is a ‘store cupboard tin’ dish. Mushy peas are also really versatile; aside from being an accompaniment to pies, meats etc they can be used to make dishes such as mushy pea curry (It’s also a slimming world recipe…bonus!) http://www.lovelygirliebits.com/2014/02/slimming-world-7-slimming-world-mushy.html and I also use them to make a quick pea and ham soup. Simply chop 1 onion, sauté until soft in garlic oil (more about that later), add ham, 1 tin of mushy peas, approximately 1 pint of stock, season and there you have it! In my store cupboard I have olive oil, vegetable oil, 1 calorie spray ‘oil’ and my most used garlic oil. I love using garlic oil in recipes as it saves having to peel, chop and get smelly fingers! It’s brilliant for adding flavour in dishes and makes life so much easier. I only use Sainsburys ‘basic’ stock cubes, as I find some of the larger (and more expensive) pots contain a huge amount of salt which can overwhelm the flavours of your food. Now, I have to admit these particular stock cubes do make you work for your meal…they are very hard to break down but it is easier if you crumble them into a dish over the stove, as the heat and moisture from the pan helps them disintegrate. My final store cupboard basics are basmati rice (I find it the easiest to cook and most flavoursome) and pasta (yet again, Sainsburys basics) as both allow for cheap and cheerful meals. If you have the key basics at home then you are all set to start making more frugal (and tasty!) meals from scratch. < Previous Frugal or free ways to keep the kids busy this half term! Next > Prepping for a fun-filled summer! Back to budgeting… and the joys of pumpkin!